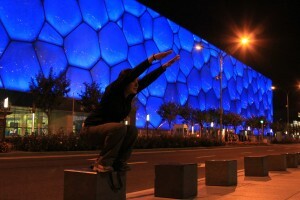 Josh and I made a quick visit to the Olympic Park one night. To get there we took the Subway which we used to get everywhere in Beijing and tickets are just 2 RMB (25 cents) a ticket. Bonus. There are actually two stations on Line 8 that you can alight at for the Olympic Park. Not being sure which one was best we took our cue from all the Chinese passengers to get off en masse at Olympic Green Subway Station. 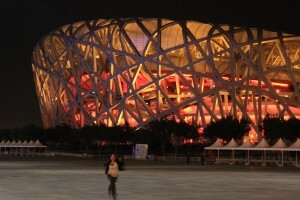 We followed like sheep and were not disappointed when we exited to see the Bird’s Nest looming directly in front of us all lit up. 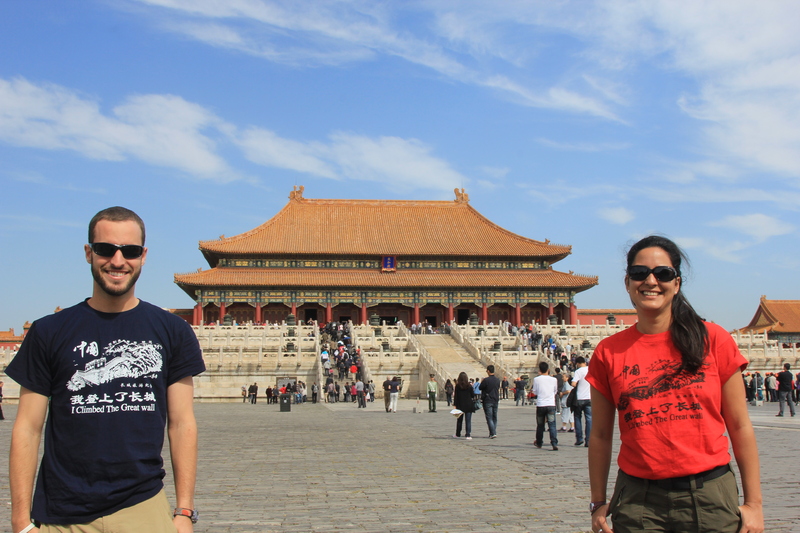 The Chinese really know how to take building to a grand scale. And it worked for the Olympics. Beautiful. 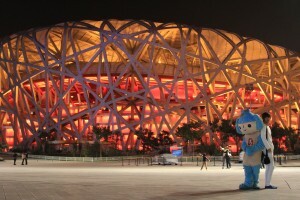 A Chinese tourist posing with the Olympic mascot. It’s supposedly the biggest steel structure in the world. But post Olympics they don’t really have a use for it. It’s too big for ordinary sports games. Apparently there’s talk of turning it into a shopping mall in a few years. Right now, they are making some change charging 50RMB ($8) to enter. We declined not being too excited to see stadium seats at night. 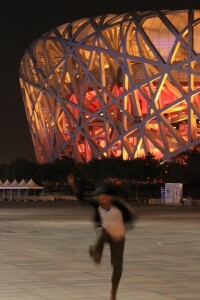 But I mostly took advantage of the venue to show-off my athletic skills. Ready to dive in outside The Cube. and I made it! Barely.